What happens when she opens the bathroom door? It will be like the fish and loaves, except with water, and it will flood the whole house. 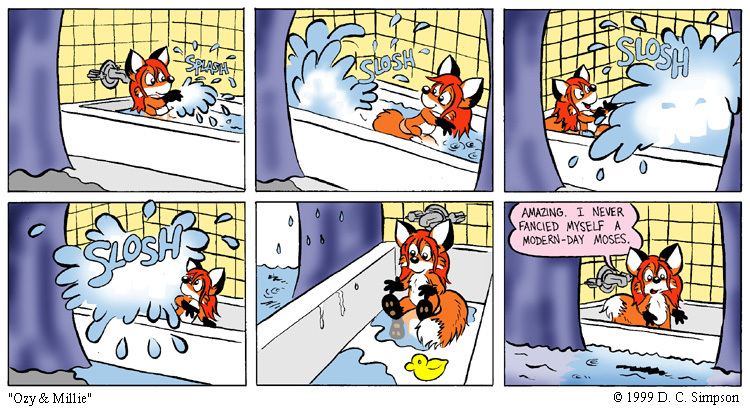 If the water level is that high it’s either an incredibly small bathroom or Millie refilled the tub and did that multiple times between the last two panels. Also, that door is closed tight. And what about the register for heating…is the water pouring down it? Millie will have to do a mass exodus when her mom finds this mess. im more impressed by the fact that the door is shut down really tight maybe Ms.mudd foresight this?